This article brought to you by Overwolf. Your path to perfection on Summoner’s Rift just got easier. OP.gg, an analytics website with 30 million monthly active users, now has its own app on Overwolf. Op.GG gives League players the tools to improve their game thanks to billions of data points collected every day by the website. The service is available in 11 regions across 20 different languages, and also provides statistics for other games such as PlayerUnknown’s Battlegrounds. Now, all that data also lives on an app on Overwolf, a software that gives PC gamers over 300 applications to use while playing their favorite games. It acts both as an appstore and a platform for overlay applications such as OP.GG’s official app. 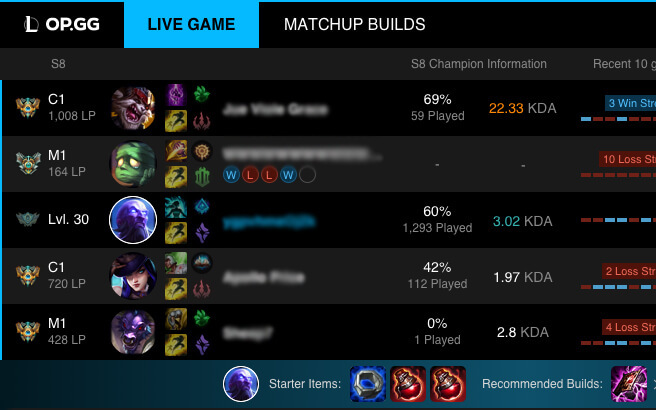 The OP.GG app can be used to learn who your opponents are while waiting in the lobby or playing against them. With the OP.GG app, players can see who is dropping back into Summoner’s Rift on a hot winning streak, what they use for runes and recommendations on how to counteract their strategies with specific builds and champions. To get all of this intel, and more, from OP.GG in-game, simply run Overwolf in the background with the OP.GG app activated while playing League of Legends. No alt-tabbing. No second screen. Using this application is as simple as playing a game of ARAM. You can download the OP.GG app for free at Overwolf.